Over 15,000 deaths a year are suffered by automobile drivers nationwide because their car roofs are dangerously defectively designed by car manufacturers. Most cars have a very thin and unstable roof which collapses and crushes inward during any car rollover accident. When the car roof collapses and crushes inward the driver and his passengers sustain fatal injuries. The car manufacturers know that stronger car roofs save lives. There is no question that a car’s roof strength is directly related to crushing injuries and fatalities. Expert witnesses as well as Volvo’s automobile roof crush statistical tests revealed that the roof structure plays a role in head and neck injuries in a rollover accident. Additionally, more head-space between the occupant(s) in the vehicle and the roof of their car saves more lives. Thus, the less a person’s head touches their car roof, the more likely a reduction of injuries and less chance of death(s). After Volvo completed their roof crash studies and released their statistical data to the automotive industry, Volvo took positive steps in improving consumer safety in their vehicles. Mercedes Benz took positive steps and has solid roofs in their cars. Unfortunately, most car manufacturers have done little or nothing to protect consumers from roof crush injuries in rollover accidents. The automobile manufacturers know how to manufacturer a more solid roof. Unfortunately, Chevrolet and Ford have been extremely slow to respond to plaintiff’s (victim’s) complaints that their roofs are unsafe, and lack of crash worthiness make them susceptible to “roof crush” deaths. Numerous corporate car manufacturer’s mentality is that corporate profits and cost cutting is more important that saving lives. 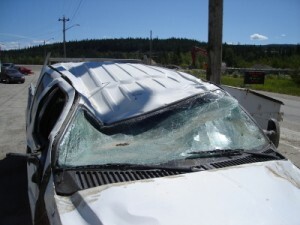 There is solid evidence that there is a casual connection between an automobile roof strength and crushing fatalities. 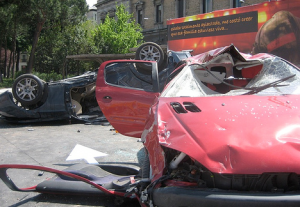 Our expert witnesses will testify based on automobile industry tests as well as their own independent tests that a stronger roof will save lives of everyone in the automobile during a rollover accident. Stronger roofs will improve driver and passenger safety. Demand accountability from the automobile manufacturers and component part manufacturers. We at the Law Offices of Gary A Kessler have handled complex automobile roof crush cases for twenty-five years. We have the litigation experience to handle complex automobile roof crush cases. We are prepared to front all costs required for the necessary investigation and expert witnesses needed to prepare your case for trial. Remember, the automobile manufacturers are a formidable foe and must be fought against aggressively. The laws regarding wrongful death/automobile roof crush cases are complex and include many facets of the law. It is vital to surviving family members to seek the advice of an experienced wrongful death/automobile roof crush lawyer such as Gary A Kessler at the Law Offices of Gary A Kessler to protect your rights and those of your loved ones. California automobile roof crush attorney Gary A Kessler and the Law Offices of Gary A Kessler are compassionate and fully understand that you are attempting to cope with extreme grief and sorrow associated with the loss of a loved one. The Law Offices of Gary A Kessler carefully selects its automobile roof crush cases so that we may give you (the client) the substantial personal attention neccessary to obtain a successful result for your case. The Law Offices of Gary A Kessler is prepared to front all costs required for a thorough investigation and expert witnesses to prepare for trial of your case. As in all wrongful death and serious personal injury cases, we advance all legal costs to prepare and present our client’s claim, and receive for our services only a percentage of what we recover for our attorney fees on their behalf. Upon settlement our costs shall be reimbursed to us from the gross recovery. If there is no recovery, no attorneys fees or costs are owed to our firm. The Law Offices of Gary A Kessler has the track record and reputation for aggressively representing our clients to recover the maximum financial compensation for our client’s losses. Contact the Law Offices of Gary A Kessler for a free consultation regarding your roof crush/crashworthiness case.